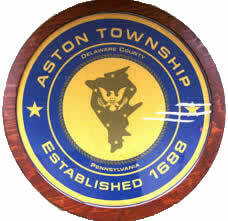 Aston PA was first settled in 1682 as a municipality and was incorporated as a township in 1688. In 1906 it became a first class township. Prior to 1687, Aston was known as Northley. Edward Carter, who was the constable of the township, changed the name from Northley to Aston in remembrance of his old home in Oxfordshire, England. Today, Aston covers approximately seven square miles, with a population of about 15,000. The population of Aston in 1870, according to the census of that year, was 1,845, of which 1,536 were native born and 309 foreign.